Dispensing guns, manual caulking guns, caulk guns. 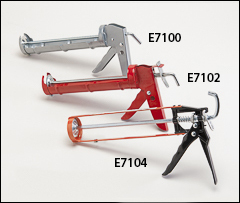 Additional hand tools are listed on the Hand tools page. Metal caulking guns fit drop-in one/tenth gallon cartridges. Ratchet style gun has deep cut teeth. Smooth rods are either round or hex shaped. Two of the guns have a Stop Flow™ thumb release lever. Additional, heavier-duty models available for one/tenth gallon or quart cartridges.